Where's your global warming now? Antarctica has been gaining ice for years. Antarctica is doing better than the Arctic, but if global warming continues, none of the world's ice is safe. The Arctic Ocean is not the only place with sea ice. The ocean surrounding the continent of Antarctica also freezes over each winter. But we don’t hear much about sea ice on the bottom of the planet. What’s happening to Antarctic sea ice and why does it matter? One reason that we hear less about Antarctic sea ice than Arctic sea ice is that it varies more from year to year and season to season than its northern counterpart. And while Arctic ice has declined precipitously over the past 30 years of the satellite record, average Antarctic sea ice extent has stayed the same or even grown slightly. Yet researchers say that Antarctic sea ice plays an important role in climate, helping to protect the Antarctic Ice Sheet from waves, warmer surface water, and warmer air that can destabilize Antarctica’s ice shelves and help speed the flow of continental ice into the ocean. And in some regions, Antarctic sea ice is not as stable as it used to be. “The two polar regions are essentially geographic opposites,” says Sharon Stammerjohn, a sea ice expert at the University of Colorado Institute for Arctic and Alpine Research (INSTAAR). “Sea ice in the Arctic Ocean is landlocked, while sea ice in the Southern Ocean is surrounded by open ocean.” That means that while Arctic sea ice is confined in a given space, Antarctic sea ice can spread out across the ocean, pushed by winds and waves. That also means that ice extent varies much more in the Southern Hemisphere than it does in the North. Overall, Antarctic sea ice has grown slightly over the past 30 years of the satellite record, but the trends are very small, and the ice extent varies a lot from year to year. In Southern Hemisphere winter months, ice extent has increased by around 1 percent per decade. In the summer, ice has increased by 2 to 3 percent per decade, but the variation is larger than the trend. Although Antarctic sea ice is increasing overall, certain regions around Antarctica are losing ice at a rapid pace (Figure 1). In the Amundsen and Bellingshausen seas, west of the Antarctic Peninsula, the sea ice cover has declined dramatically in the last 30 years, with the winter sea ice cover lasting three months less in 2010 than it did in 1979. The main areas where ice extent is growing are the Ross Sea (north of the largest U.S. base, McMurdo) and the eastern Weddell Sea (south of Africa), although there is a lot of variability. 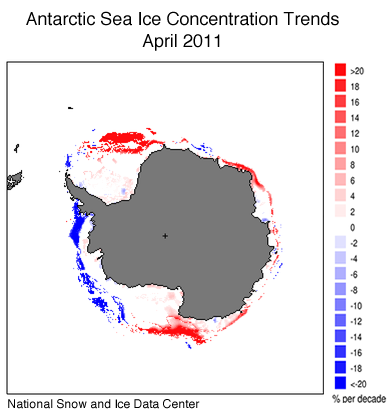 Figure 1: This map shows the trends for sea ice concentration around Antarctica in April 2011. The blue shading indicates the region to the west of the Antarctic Peninsula where sea ice concentration has declined significantly in the last 30 years. Red areas around the continent show regions where sea ice concentration was greater than normal. Overall, Antarctic sea ice shows a slight increasing trend, but in certain regions it is declining rapidly. Source: National Snow and Ice Data Center. Scientists say that this westerly wind pattern has grown stronger in recent years as a result of climate change. However, because Antarctic sea ice is so vulnerable to the changes in both the atmosphere and ocean, researchers are also looking at other climate patterns, such as the high latitude response to the El Niño-Southern Oscillation, as well as the effects of changing ocean temperature and circulation, to understand how Antarctic sea ice is changing.